In the city building game Social City you need to build housing to accommodate your population. The more housing you have the greater your population will be. As you build a house or apartment people will become available for your game. It takes anywhere from few minutes to several hours for your people to appear. Above the house you will see an icon you can click on which will put the housing population into the game. Your houses will continue to produce population but you need to click on each one to get the population increase. This can involve a lot of clicking once you have enough buildings on your game map. You can also mouse over any house and it will tell you how long until the next population is available. Small houses for example produce ten population while apartments generate a lot more. A basic house will produce ten population in eight minutes. The citizens of your city need to be entertained and you can do this by constructing leisure buildings on your game map. Towards the right of your game screen at the to you will find a happiness icon. This will give you a good indication if you need more leisure buildings. It is a good idea once you have a few houses setup to get some leisure buildings going too. If you click on the leisure tab and select a building it will give you the amount of leisure it produces. So for example the basketball court produces 200 leisure while the police station produces 1550 leisure. Municipal buildings like the police station also count as leisure and you can find them in the leisure main tab. You need to balance leisure and population to keep your citizens happy in the game. The main way you make money in Social City is to construct factories. Each factory you construct can take on contracts to produce goods. It will take some game coin and time to produce the goods and once they are ready you will receive the profit from the goods produced. If you click on a factory as its producing goods you can choose to delete the contract and start on something new. As you progress and level up you will have more factories you can run for extra income. If you click on the contract tab you will find al the various different goods you can produce. Contracts do several things for you they gain you income, experience points, and cost you a few coins too. Each contact has a timer that will count down until the contract is ready. For example stuffed animals take 14hrs to produce, cost 750 coins, pay you 7000 coins upon completion, and give you forty nine experience for the completed contract. If you leave a completed contact sitting for too long it will expire and you will lose your money. Once your contract is done you can start on new one and keep your income coming into your city. Factories and leisure buildings need to be cleaned periodically. Leisurefactory you need to click on it to reset it after the contract is over so you can start on the next one. Houses don’t need cleaning they only produce population. It is up to you to decide what to build in the early stages of your game but you should stick with inexpensive cottages. A basic cottage will cost you 2000 coins and give you ten population every eight minutes. Once you have a few houses you can move onto leisure buildings. Early leisure buildings should include a basketball court and a burger joint as these are inexpensive. If you subscribe to the game you will get a post office leisure building which supplies a huge 5000 leisure bonus so you should get that as soon as possible. Once you have a couple of leisure buildings put up your first factory and start producing goods. As you acquire more population you can erect more factories and increase your income levels. There are a few basic decorative tiles you can add to your game to make it more colorful. These include terrain tiles, trees, and some fountains. These aren’t really necessary in the beginning of your game and you should avoid spending valuable cash on them. They do however provide leisure points but are best use later on in your game. You can expand your play area by having Facebook friends and coins or by using game cash. Every level you will get one free game cash which you can put towards expansions. 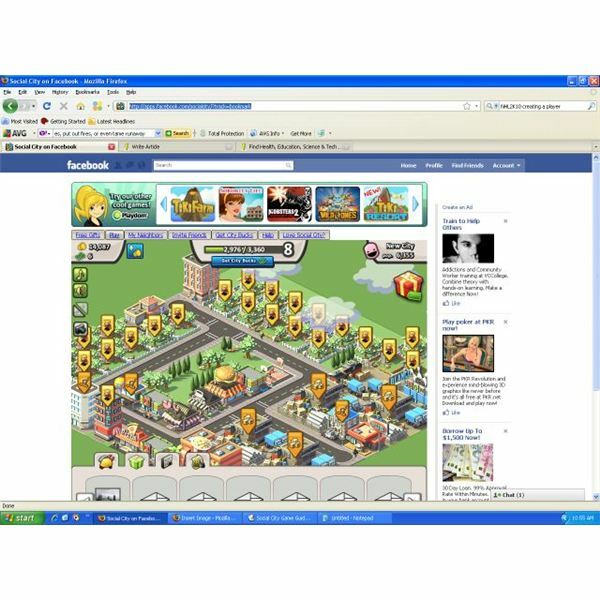 Like many Facebook games you can send your friends gifts and even visit their cities. You will get little tasks to do which will give you some rewards. The best use for friends however is to help your city expand quickly without paying game cash for it. Since this game is new it has had a few perfoermanc issues. It tends to run better on Firefox and Google Chrome browsers. if you have problems try to clear your browser cache and reload the game. The Playdom Forums can also be a source of help if you just can’t get it to work. 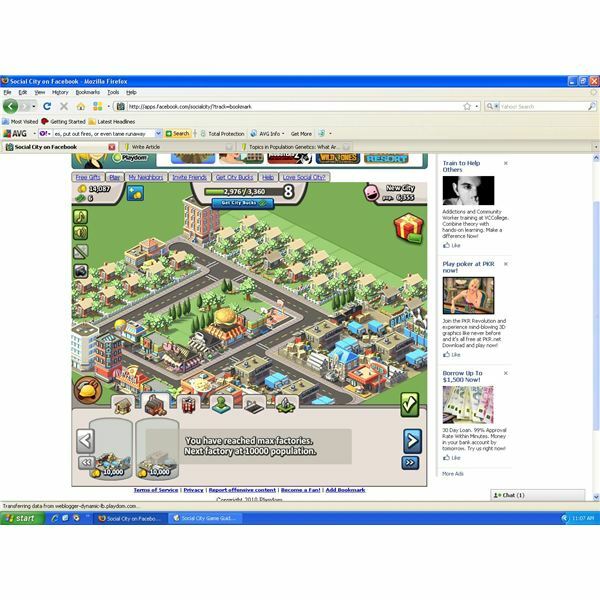 Social city is a great city building game and one of the best ones of it’s genre on Facebook. Be sure to manage your population and have enough leisure buildings for them. Login periodically to collect the cash from your factories but don’t let them sit too long or you will lose the amount. Enjoy the game and be sue to check it often for new content. 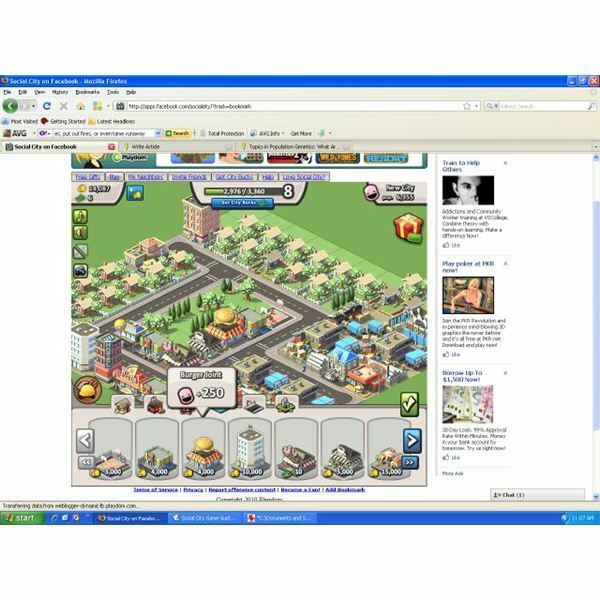 A collection of other articles about Social City for Facebook.